As I said earlier this week, I have always been a huge fan of Spicy Buffalo Sauce. So when the craving hit, I knew I would need to act on it. The first step was sauce, which turned out be a great success. The second step was to decide what to do with the sauce one I made it (other than dipping random vegetables and an occasional finger in it). As much as I love Buffalo sauce, I am not a huge fan of eating meat off of bones. Every once in a while I’ll get a craving for traditional wings, but usually I like to stick with the boneless variety. Keeping that in mind I tossed around a few ideas and finally decided that what I really wanted was Buffalo chicken sandwiches. 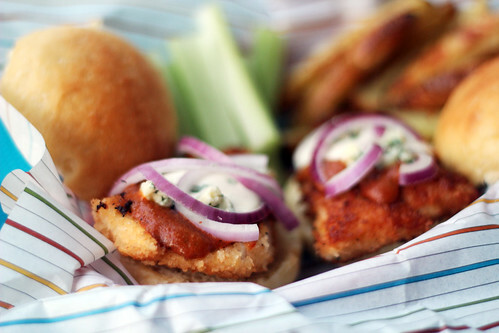 More specifically, crispy coated chicken, with a balance between spicy sauce and cool creamy ranch, a few blue cheese crumbles, all on top of a soft and somewhat sweet bun. I don’t think I can even describe to you how much this meal hit the spot. *I was going for sliders so I cut mine into about 2.5×2.5 inch pieces, about 5 from each breast. The key is to make sure each “chunk” is about the size of your slider rolls and no more than 1/2 inch thick. In a shallow bowl, mix together the panko, garlic powder, paprika, salt and pepper, and 1 tablespoon canola oil. Place the egg in separate bowl. Coat the chicken by dipping into the egg first, then the panko mixture. To cook by pan frying, heat 1 tablespoon of oil in a large skillet over medium-high heat. Cook the chicken in batches, so as not to over crowd the pan, until all of the chicken is cooked through, about 3-4 minutes on each side. Add additional tablespoon of oil in between batches and as needed if the pan becomes dry. To cook by oven baking, preheat oven to 450 degrees and prepare a baking sheet by placing a wire (cooling) rack over the tray and lightly spraying with non-stick spray.. Place the coated chicken on the wire rack and bake for about 10 minutes, or until a piece of chicken cut in half is no longer pink inside, rotating pan halfway through. 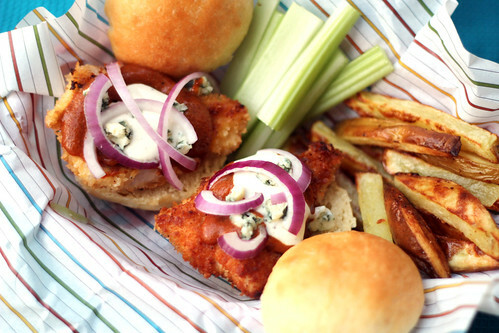 Serve on top of slider buns with Buffalo sauce, ranch dressing, blue cheese crumbles, and thinly sliced onions. 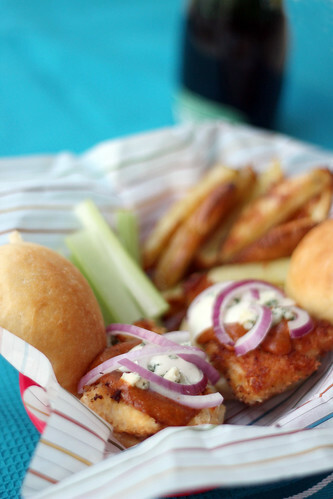 Goes well with oven fries and celery sticks. Breading/Coating recipe slightly adapted from the recipe I use for fish sticks, originally from Elly Says Opa.